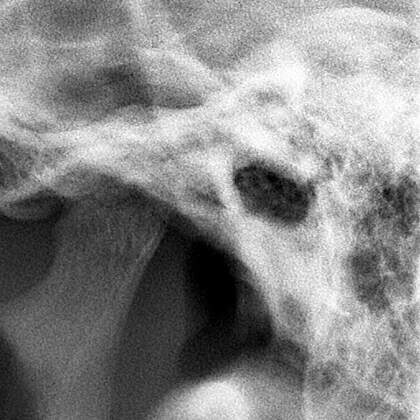 The temporomandibular joint area is challenging for good diagnostic radiographs. TMJ X-Rays are commonly used for a variety of different tasks such as diagnosing anatomic discrepancies, TMJ disorders, traumatic injuries, etc. The temporomandibular view allows for visualisation of the articular tubercle, mandibular condyle and fossa and is thus useful to identify structural changes and displaced fractures, as well as assess excursion and joint spaces. TMJ X-Rays usually occur in more traumatics situations. Clinical indications include trauma, the presence of joint noises, trismus and occlusal alterations. Your dentist may recommend a professional radiograph to you for a variety of orthodontic situations. TMJ X-Rays are not quite as common as the other X-Rays we offer, but if there are abnormalities, or any other possible harmful situations we will immediately take a TMJ X-Ray. Should your dentist recommend a TMJ X-Ray, it would be best to take the matter seriously as it is an advanced dental imaging device. The position for a TMJ X-Ray is a lot different than other X-Rays. The patient is typically seated upright with the side of interest closest to the detector. This may cause discomfort based on what part of the mouth is receiving the TMJ X-Ray. The patient's head is usually placed in a true lateral position, and depending on the projection, you may either be asked to have your mouth open or closed.